From the pages of CSI: Miami... a commonly used forensic chemical called luminol to identify traces of blood at crime scenes has been modified to be used in a novel medical test that can help differentiate a viral infection from a bacterial infection. Not uncommonly, it is sometimes hard to differentiate between a bacterial infection which is treated with antibiotics from a viral infection which is NOT treated with antibiotics. Unfortunately, in the healthcare system, too often, antibiotics are given if an infection is present whether viral or bacterial which is leading to multi-drug resistant infections like MRSA. Well with this test, physicians can potentially use it to determine whether antibiotics should be provided or not. Such a test may also be reassuring to patients who desire antibiotics, but can be told with confidence that it is not necessary and at worst, dangerous. The way this test works is by identifying the characteristic glow "signature" after luminol is applied to a suspect infection. If it glows a certain way... it's a viral infection. If it glows in a different way... it's a bacterial infection. For those scientifically inclined and curious, the glow is due to a byproduct of the body's defenses fighting off infection called "Reactive Oxygen Species". 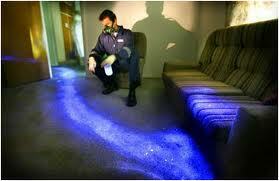 The luminol reacts with this byproduct creating a glow. Of note, the test is not yet available, but perhaps soon?? ?